It is perhaps the variety of olives that most consumers know, not only oil but also for its large consumption of table olives. It is found mainly in Andalusia, where it accounts for about 16% of all its olive grove, and more specifically it´s a widespread variety in the East of Seville, South of Cordoba and Northern of Malaga. Currently there are some 220,000 hectares. 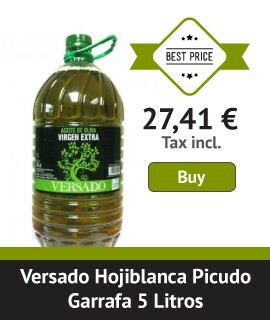 As we have said, it is used for table olives as well as for olive oil; it is an excellent oil to keep our health in good conditions, even very suitable and recommended for people who follow a diet because they are oils with a very well balanced composition of fatty acid with saturated acids relatively lower than other varieties. Its oxidation stability is not very high so we recommend keeping these oils isolated as much as possible from the light and they mustn´t be in highly oxygenated areas. When you taste these oils you are going to notice a wide range of aromas and flavors very easily detectable and follow a common pattern in many of them. Thus, it seems slightly sweet when entering mouth, with aromas of fresh grass and slightly bitter green fruit or fruit salad memories, light spicy in throat and almond aftertaste at the end. You should definitely try this variety, if you have not already done so. There are many extra virgin olive oils that are varieties blend (mixture), and in the blend hojiblanca is used frequently for its great properties and distinctive flavors. We dare to prepare a selection to you of them, so you can choose by yourself the one you like best.